Beavers are among the most skillful builders in the animal world and are famous for constructing dams across rivers and streams. Beavers are also known locally for wreaking havoc on newly planted restoration projects and native trees. 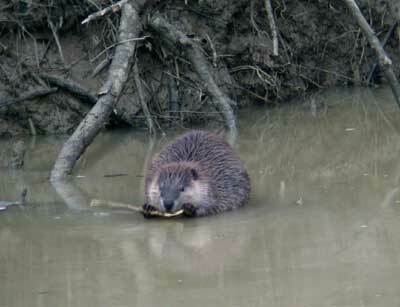 In order to protect restoration plantings while keeping both beaver and other wildlife healthy, methods have been developed to manage beavers in local riparian areas. Progressive beaver management methods include wire wrapping of mature trees, beaver gnawing deterrents, and beaver exclusion fencing. Join the Putah Creek Council for a workshop this Sunday, February 1 from 1:00 to 3:00 pm to learn more about beaver behavior and management. Local beaver expert Mary Tappel who has mapped and photographed the beaver dams and ponds along Putah Creek will lead the workshop. The workshop is free and open to the public. Please meet at the UC Davis Putah Creek Reserve picnic area and fire ring. Mary Tappel was raised in Davis and spent her childhood exploring Putah Creek. She has a degree in Botany from UC Davis and does consultant work on beaver management for the Sacramento Area Flood Control Agency (SAFCA). She will be speaking on her own time as a volunteer for this workshop and not on behalf of any agency.